Australian singer-songwriter Vance Joy certainly took his time between his March 2013 EP release and this week’s release of his debut album, but it was well worth the wait: Dream Your Life Away, which was released to Australian audiences on Friday and releases to the rest of the world this week, is a solid forty minutes of folk-rock greatness. The album finds Vance Joy expanding on the melodic, soulful folk sounds he first introduced to the world on last year’s God Loves You When You’re Dancing EP. Whereas many debut albums heavily feature previously released EP content, Dream Your Life Away is a collection of mostly new musical material. Singles “Riptide” and “From Afar” have been carried over from Vance Joy’s EP, but their presence is welcome and expected – especially in the case of “Riptide,” which was voted number 1 on the 2013 Triple J Hottest 100 list. If you haven’t heard it yet, give a quick listen before reading on. The eleven-track Dream Your Life Away builds progressively in musical style and energy, beginning with Vance Joy’s well-established folk-rock and diving into elements of indie folk (ala Bon Iver) and pop-rock (ala Train) before ending with the hard-hitting rocker “All I Ever Wanted.” The album develops so dramatically that the overdriven guitar on “All I Ever Wanted” sounds out of place when listened to after the album’s first tracks, but right at home if the album is listened to in proper order. Vance Joy creates and maintains a recognizable identity throughout these stylistic changes, keeping aspects such as instrumentation and his vocal style constant from start to finish. Vance Joy’s music can best be described as a mix between the folk-induced rock of Mumford and Sons and the softer, indie folk of Bon Iver. As a guitar-playing singer-songwriter, Vance Joy strikes a balanced medium between American counterparts Jason Mraz and Jack Johnson: Vance Joy’s songs are rhythmic and catchy, light and deep all at once. His vocal switches between chest voice and falsetto allow him to create a niche brand that is all his own. Opening track “Winds of Change” sets the scene for the album, starting strong as Vance Joy sings a Bob Dylan-esque lyric backed by guitar and violin: “I miss you more than you could know / I watch the grass on the back lawn grow / And I will not let the winds of change to blow / And I hope you decide to come back home.” Vance Joy’s voice, lilting and powerful, finds support from fuller harmonies and backing vocals in the chorus. “Winds of Change” allows Vance Joy to introduce his songwriting, voice and sound to listeners while leaving plenty of room to grow. Additional notable moments on Dream Your Life Away include the musically playful, lyrically deep “Who Am I,” the lovesick ballad “Georgia,” and the poetic, bass drum thumping “First Time.” Vance Joy’s lyrics are honest, thoughtful and reflective. Take, for instance, the hook for “First Time”: “There will always be another time for us to fall in love, but it never cuts you quite as deep as that first time.” Vance Joy’s words are easy to connect with and to sing along to, which makes the music all the more enjoyable. 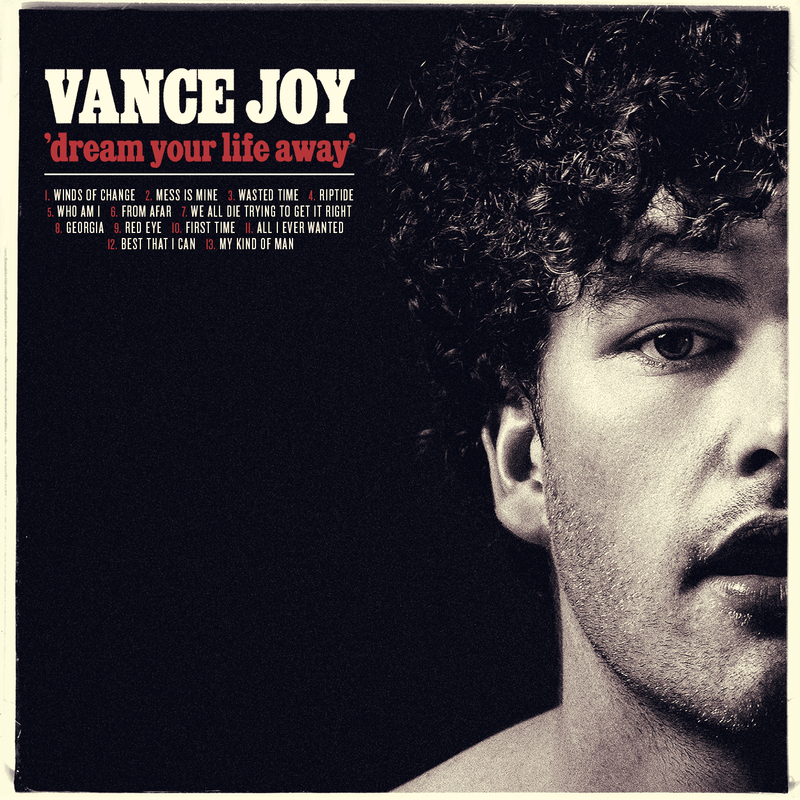 Vance Joy’s Dream Your Life Away displays an understanding of musical continuity that is seldom present on debut efforts. The album rises, falls, and rises again, subtly manipulating the mood as time progresses. Vance Joy maintains musical identity while developing outward from the folk-rock genre. As a result, Dream Your Life Away ends far from where it begins, making one wonder if Vance Joy is headed towards a harder rock sound. Whatever his future direction may be, Vance Joy has established himself today as a folk-rock artist with significant potential to grow in any number of directions. Dream Your Life Away is itself a musical daydream, and one in which you can lay your head back, relax, close your eyes, and drift away peacefully.